Note: You should not store confidential information unless it is encrypted. 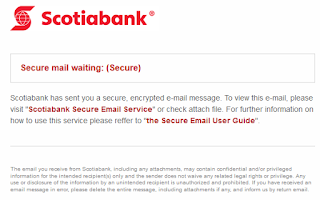 Attached is a file RBCSecureMessage.doc which contains some sort of macro-based malware. It displays the following page to entice victims to disable their security settings. I recommend you block 64.91.248.128/27 at your email gateway to be sure. Malware spam: "Royal Bancshares of Pennsylvania, Inc." / "Latest invoice [Urgent]"
We are writing to you about fact, despite previous reminders, there remains an outstanding amount of USD 5883,16 in respect of the invoice(s) contained in current letter. This was due for payment on 17 April, 2016. Our credit terms stipulate full payment within 3 days and this amount is now more than 14 days overdue. If the full amount of the sum outstanding, as set above, is not paid within 7 days of the date of this email, we will begin legal action, without warning, for a court order requiring payment. We may also commence insolvency proceedings. Legal proceedings can take affect on any credit rating. The costs of legal proceedings and any other amounts which the court orders must also be paid in addition to the debt. This email is being sent to you according to the Practice Direction on Pre-Action Conduct (the PDPAC) contained in the Civil Procedure Rules, The court has the power to sanction your continuing failure to respond. To view the the original invoice in the attachment please use Adobe Reader. We await your prompt reaction to this email. The only sample I have seen of this is malformed and the attachment cannot be downloaded. However, what it should be in this case is a file Latest invoice18.zip containing a malicious script 2016INV-APR232621.pdf.js. Analysis of this obfuscated script is pending, it is likely to be either Locky ransomware or the Dridex banking trojan. From "FDIC, Federal Reserve Bank"
(FDIC). The directive concerns U.S. Federal Wire and ACH online payments. 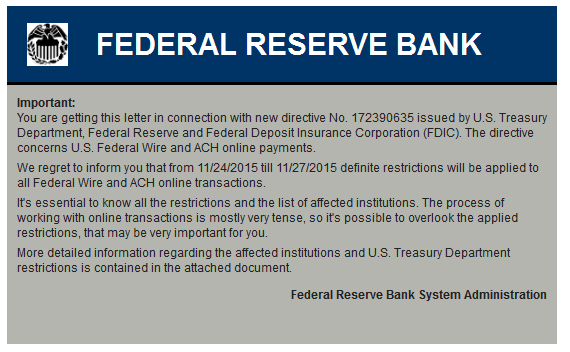 will be applied to all Federal Wire and ACH online transactions. It's essential to know all the restrictions and the list of affected institutions. to overlook the applied restrictions, that may be very important for you. restrictions is contained in the attached document. Subject Attention!FED Wire and ACH Restrictions Applied! Subject FED Wire and ACH Restrictions. IMPORTANT! Subject U.S. Treasury Department. FED Wire and ACH Restrictions Applied. Attached is an Excel file made up of part of the recipient's domain name plus a random number. So far I have seen two samples of this (VirusTotal  ) the latter of which is corrupt. The woirking one contains a macro that looks like this. According to this Malwr report it drops all sorts of files including _iscrypt.dll [VT 0/54] and 2.exe [VT 2/54] which is analysed in this Malwr report and this Hybrid Analysis report. It is unclear as to what it does (ransomware? remote access trojan? ), but it appears that the installation may be password protected. This Hybrid Analysis report shows various web pages popping up from the Excel spreadsheet, including MSN and Lidl. The purpose of this is unknown. We have received this documents from your bank regarding an incoming SWIFT transfer. and any attached documentation. Thank you. Attached is a file SWIFT_transfer.zip which contains a malicious executable SWIFT_transfer.scr which currently has a detection rate of 2/56. Automated analysis is pending, although the payload is almost definitely Upatre/Dyre. Please check back later. The Hybrid Analysis report shows Upatre/Dyre activity, including the malware phoning home to a familiar IP address of 197.149.90.166 in Nigeria which I recommend you block or monitor. Malware spam "Info from SantanderBillpayment.co.uk" / "Santanderbillpayment-noreply@SantanderBillPayment.co.uk"
Thank you for using BillPay. Please keep this email for your records. The following transaction was received on 29 September 2015 at 09:11:36. For more details please check attached payment slip. Your transaction reference number for this payment is IR0343884. Please quote this reference number in any future communication regarding this payment. the sender on 0300 200 3601 and delete the message immediately. using, or telling anyone about its contents. Fair Trading. FSA registration numbers: 106054, 146003 and 423530 respectively. Narborough LE19 0AL. Company numbers: 2294747, 2338548 and 1533123 respectively. Registered in England. Santander and the flame logo are registered trademarks. The attachment is named SantanderBillPayment_Slip0343884.zip although I have not been able to get a working copy. The payload is most likely the Upatre/Dyre banking trojan. My sources tell me that the current wave of this is phoning home to 197.149.90.166 in Nigeria which is worth blocking or monitoring. Malware spam: "Bankline ROI - Password Re-activation Form" / "secure.message@rbs.co.uk"
box is selected in section 3. A signatory on the bank mandate must sign the form. hours and communicate this to the user by email. activation code will expire and a new one must be ordered. new activation code from within the system and reset your security sooner. 1850 310269 and one of our associates will be happy to assist you. does not accept responsibility for changes made to this message after it was sent. the recipient should carry out such virus and other checks as it considers appropriate. In the sample I saw, the attached file was Bankline_Password_reset_3537684.zip containing a malicious exeucutable Bankline_Password_reset_8569474.scr which has a VirusTotal detection rate of 2/56. The Hybrid Analysis report shows behaviour consistent with Upatre / Dyre and shows that the malware communicates with a known bad IP of 197.149.90.166 (Cobranet, Nigeria) which I definitely recommend blocking or monitoring. Malware spam: "Transaction confirmation" / "donotreply@lloydsbank.co.uk"
account. Kindly sign and forward the copy to us for approval. Attached is a file Notice.zip which contains a malicious executable Value mortgage policy .exe (note the rogue space) which has a VirusTotal detection rate of 3/55. The Hybrid Analysis report shows activity consistent with Upatre/Dridex including a key indicator of traffic to 197.149.90.166 in Nigeria. Malware spam: "Lloyds Bank - Pendeford Securities - Please Read Action Required/PI Documents/ Region code East 2/ 8715811/"
Please find attached our document pack for the above customer. Once completed please return via email to the below address. 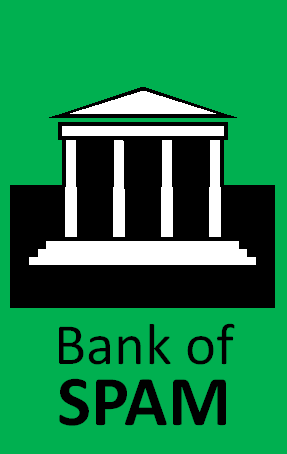 Lloyds Bank plc, Bank of Scotland plc are authorised by the Prudential Regulation Authority and regulated by the Financial Conduct Authority and Prudential Regulation Authority. Cheltenham & Gloucester plc is authorised and regulated by the Financial Conduct Authority. Halifax is a division of Bank of Scotland plc. Cheltenham & Gloucester Savings is a division of Lloyds Bank plc. HBOS plc. Registered Office: The Mound, Edinburgh EH1 1YZ. Registered in Scotland no. SC453043. This has a detection rate of 3/56. The general characteristics of this file make it a close match to the Upatre/Dyre payload of this concurrent spam run (automated analysis is pending). 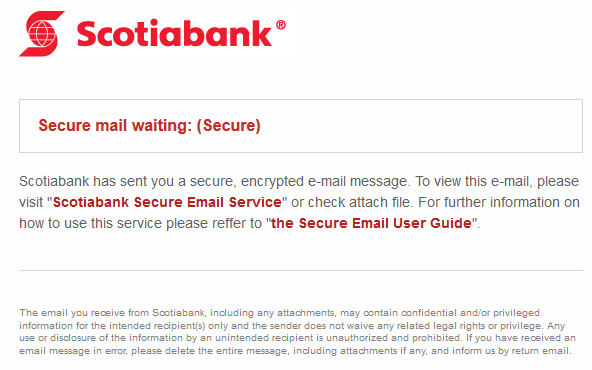 Malware spam: "HSBC SecureMail" / "You have received a secure message"
Read your secure message by opening the attachment. You will be prompted to open (view) the file or save (download) it to your computer. For best results, save the file first, then open it with Internet Explorer. If you have concerns about the validity of this message, please contact the sender directly. For questions please contact the HSBC Secure Mail Help Desk. Attacked is a file HSBC_Payment_87441653.zip which in turn contains a malicious executable HSBC_Payment_87441653.exe, this has a VirusTotal detection rate of 4/56. UPDATE: The Hybrid Analysis report shows network traffic to a familiar Nigerian IP of 197.149.90.166 which I strongly recommend you block. The traffic pattern is indicative of Upatre dropping the Dyre banking trojan. Kindly be informed that bank did noticed suspect attempt of money withdrawal relating to Your debit card. Please find enclosed bank e-mail sent by financial department on Monday. As well attached are security details for Your review. Kindly be acknowledged that bank had found unauthorised attempt of amounts withdrawal from Your credit card. Please find enclosed bank warning provided by bank manager earlier. Also enclosed are security details for Your affirmation. Kindly be informed that bank security department has found illegal attempt of money withdrawal from Your Mastercard account. Please check the enclosed bank publication provided by banking department today. As well attached are security details for Your approval. Kindly note that bank did noticed suspect attempt of amounts withdrawal related to Your Mastercard. Please examine the enclosed bank statement sent by manager on Monday. Furthermore attached are personal details for Your confirmation. Kindly be acknowledged that bank security department had detected suspect attempt of money withdrawal related to Your debit card. Please check the enclosed bank statement forwarded by banking department today. In addition attached are security details for Your control. That IP is allocated to Cogent Communications in Mexico. The download is Upatre which means that the payload is almost definitely the Dyre banking trojan, even though the delivery mechanism of a Word document is unusual for Dyre. Malware spam: "This is a Remitter Advice following the submission of a payment instruction by Lloyds Bank Plc." / "Australian Taxation Office"
This spam doesn't seem to know if it's from Lloyds Bank or the Australian Tax Office. This is a Remitter Advice following the submission of a payment instruction by Lloyds Bank Plc. Please review the details of the payment here. The link in the email goes to a download page at sharefile.com and leads to an archive file FAX_82APL932UN_772.zip containing a malicious executable FAX_82APL932UN_772.scr which has a date stamp of 01/01/2002 (presumably to make it harder to spot). This is renamed to csrss_15.exe and has a detection rate of 3/54. It is most likely a component of the Dyre banking trojan. Malware spam: "invoice@bankline.ulsterbank.ie" / "Outstanding invoice"
This fake banking email leads to malware. Please find the attached copy invoice which is showing as unpaid on our ledger. I would be grateful if you could look into this matter and advise on an expected payment date . The link in the email leads to a download location at hightail.com (the sample I saw downloaded from https://www.hightail.com/download/e?phi_action=app/directDownload&fl=SWhZekZucVhVbTlFQlFJWjA4bnVnVE9yZWt5UmdteDRsUjJuWENHRzVZbz0) which is a file called Doc_0062119-LQ.zip which in turn contains the malicious executable Doc_0062119-LQ.scr. According to the Malwr report, the downloader drops a file gkkjxyz22.exe which has a detection rate of 2/57. This is probably the Dyre banking trojan. Malware spam: "JP Morgan Access [Carrie.Tolstedt@jpmorgan.com]" / "FW: Customer account docs"
This fake financial spam comes with a malicious attachment. We have received the following documents regarding your account, if you would like to confirm the changes please check / view the documents please click here. As it happens, Carrie L Tolstedt is a real executive... at Wells Fargo. The lady in the picture is another Wells Fargo employee entirely. But anyway, this is a simple forgery containing a link to a file at Cubby which downloads as Documents_JP3922PV8.zip and contains a malicious file Documents_JP3922PV8.exe which has a icon to make it look like an Adobe acrobat file. It then attempts to POST data to an IP at 109.230.131.95 (Vsevnet Ltd. Russia) which is a critical IP to block if you want to protect yourself against this type of Upatre / Dyre attack. The Malwr report also shows that amongst other things it downloads an executable lwxzqrk36.exe which has a detection rate of just 2/57. 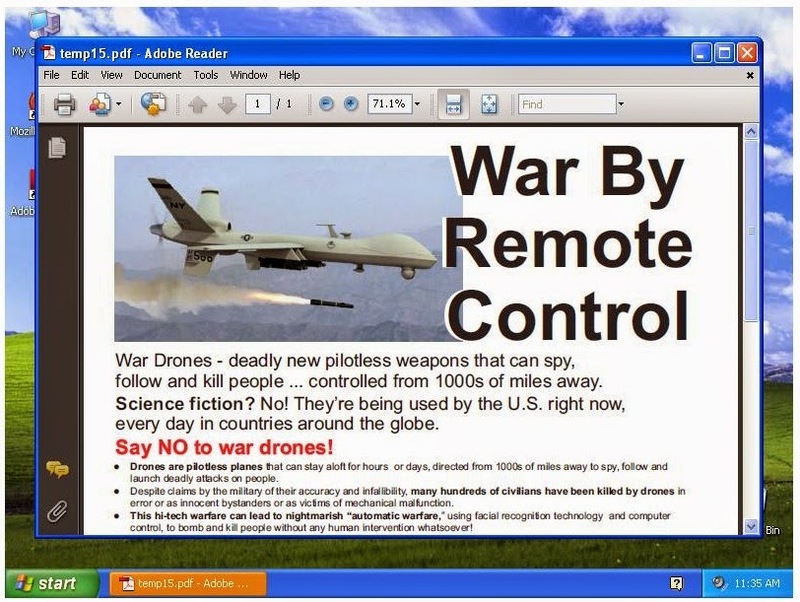 That Malwr report also shows that it downloads and pops up a PDF about drone strikes. Presumably this PDF pops up to make the victim think that they have been duped into opening some politically-themed spam. Instead, they have actually installed the Dyre banking trojan.. in other words, the victim may well think that it is nothing serious when it really is. The download locations for this Upatre/Dyre combination change all the time, but the IP address of 109.230.131.95 has been around for a little while. Also, it is a characteristic of this malware that it calls out to checkip.dyndns.org to determine the client IP address.. monitoring for traffic going to that location can be a useful indicator of infection. 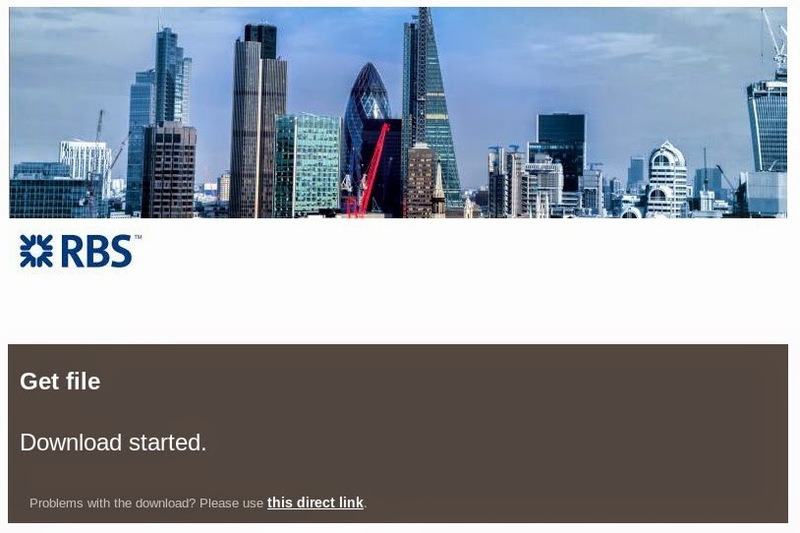 Malware spam: "You have received a new secure message from BankLine" / "Bankline [secure.message@business.natwest.com]"
This fake banking spam leads to malware. Your Documents have been uploaded to Cubby cloud storage. Cubby cloud storage is a cloud data service powered by LogMeIn, Inc. If you have concerns about the validity of this message, please contact the sender directly. For questions please contact the Bankline Bank Secure Email Help Desk at 0131 556 8719. This downloads a ZIP file from cubbyusercontent.com which contains a malicious executable Business Secure Message.exe which has a VirusTotal detection rate of just 1/57. It also appears that there is an attempted connection to 212.56.214.203. Of all of these IPs, 190.111.9.129 (Navega.com, Guatemala) is the most critical to block. It is also a characteristic of this malware (Upatre/Dyre) that it connects to checkip.dyndns.org to work out the IP address of the infected machine, it is worth checking for traffic to this domain. The Malwr report shows several dropped files, including fyuTTs27.exe which has a VirusTotal detection rate of 4/57. Malware spam: "BACS Transfer : Remittance for.."
So far I have only seen one sample of this.. This is then saved as %TEMP%\iHGdsf.exe. This has a VirusTotal detection rate of 6/57 identifying it as a Dridex downloaded. You can see the Malwr report here. 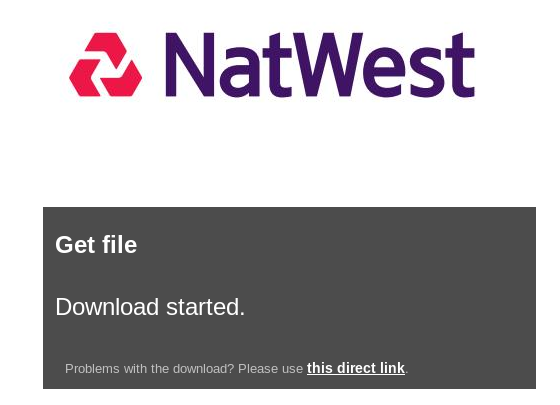 Malware spam: "CardsOnLine@natwesti.com" / "Cards OnLine E-Statement E-Mail Notification"
Your July 30, 2014 E-Statement for account number xxxxxxxxxxxx6956 from Cards OnLine is now available. Many internet users have recently been targeted through bogus E-Mails by fraudsters claiming to be from their bank. These E-Mails ask customers to provide their internet banking security details in order to reactivate their account or verify an E-Mail address. Please be on your guard against E-Mails that request any of your security details. If you receive an e-mail like this you must not respond. Please remember that, for security reasons, apart from when you create them at registration or when you change your Internet Pin or Password, we will only ever ask you to enter random characters from your Internet PIN and Password when you logon to this service. You must keep your security details secret. We would never ask you, by E-Mail, to enter (or record) these details in full and you must not respond to E-Mails asking for this information. Office: 135 Bishopsgate, London EC2M 3UR. Authorised and regulated by the Financial Services Authority. This E-Mail message is confidential and for use by the addressee only. 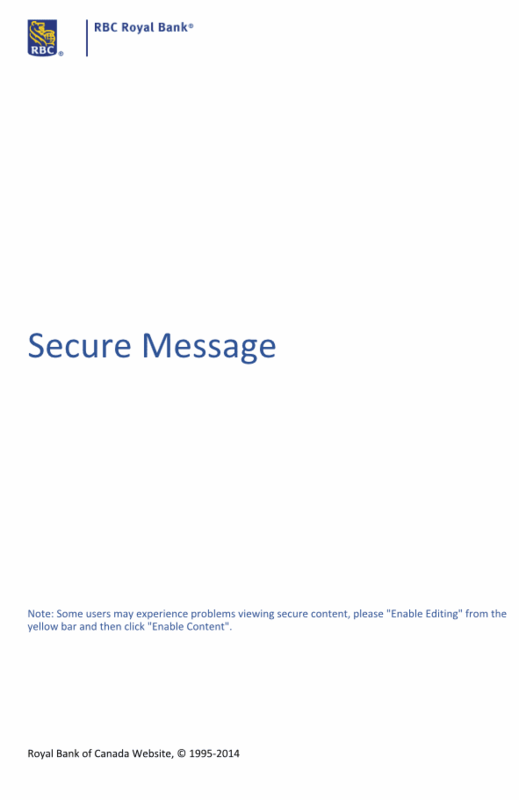 If the message is received by anyone other than the addressee, please return the message to the sender by replying to it and then delete the message from your computer. Internet E-Mails are not necessarily secure. National Westminster Bank Plc does not accept responsibility for changes made to this message after it was sent. Whilst all reasonable care has been taken to avoid the transmission of viruses, it is the responsibility of the recipient to ensure that the onward transmission, opening or use of this message and any attachments will not adversely affect its systems or data. No responsibility is accepted by National Westminster Bank Plc in this regard and the recipient should carry out such virus and other checks as it considers appropriate. The link in the email downloads a randomly-named file in the format security_notice55838.zip which contains a malicious binary which will have a name similar to security_notice18074.exe. This binary has a VirusTotal detection rate of 1/56 and is identified by Norman AV as Upatre. Automated analysis tools are not particularly enlightening  . Malware spam: "You have received a new secure message from BankLine"
For some reason these RBS BankLine spam messages are a popular mechanism for the bad guys to spread malware. If you have concerns about the validity of this message, please contact the sender directly. For questions please contact the Bankline Bank Secure Email Help Desk at 0131 556 3513. The link on that landing page goes to http://animation-1.com/js/jquery-1.41.15.js?get_message which downloads a ZIP file called Bankline_document_pdf71274.zip (or something similar) containing an executable file named something like Bankline_document_pdf24372.exe. The numbers change in each case, and indeed the executable changes slightly every time it is downloaded. The ThreatExpert report shows that it attempt to communicate with the well-known-bad-IP of 202.153.35.133 (Excell Media Pvt Ltd, India) which is associated with the Dyre banking trojan. Malware spam: "Barclays - Important Update, read carefully!" / "Barclays Online Bank [security-update@barclays.com]"
This fake Barclays spam leads to malware. Subject: Barclays - Important Update, read carefully! The file itself is an Upatre downloader, with poor detection rates   . Out of these 202.153.35.133 (Excell Media Pvt Ltd, India) is one you should definitely block. This downloader drops several files including (in this case) %TEMP%\sJFcN24.exe which has a VirusTotal detection rate of just 3/57 and is identified as Dyreza.C by Norman anti-virus. but if you are not happy with this and would like a hard copy please let me know. New bank details for BACS payments are Santander Bank Sort Code 0544422 Account No 5600544422. The numbers in the email are randomly generated, as is the filename of the attachment (in this example it was invoice_0544422.doc). The document itself is malicious and has a VirusTotal detection rate of 5/53. Inside the Word document is a macro [pastebin] that attempts to download an execute a malicious binary from http://centrumvooryoga.nl/docs/bin.exe which is currently 404ing which is a good sign. There's a fair chance that the spammers will use this format again, so always be cautious of unsolicited email attachments.